"Words are dismally inadequate substitutes for the actual music," says Thomas Owens in the introduction to his detailed and complex. Bebop: The Music and the Players, and he adds "notated examples are closer to the real thing. but are also inadequate no matter how carefully written. This raises interesting questions about how music can be described, and perhaps it is almost impossible. There may be little benefit for most readers in the kind of account that simply puts into words what happens in a recorded performance. Why not just listen to the music? On the other hand, is there anything to be added to our appreciation of music by knowing about the habits, bad and otherwise, of the musicians? I suppose the best test, for a layman, is to judge a piece of jazz writing by how much it makes you want to refer to the actual music. The level of technical description ought not to confuse, nor should the gossip affect our appraisal of what we hear. A reader with little, or no, awareness of musical notation might well be initially baffled by Owens. His book does provide some general information about the development of bebop, and how individual players shaped it, but a great deal of time is spent analysing passages from various recordings, and a fair amount of technical knowledge is required to understand what is said. But it's worth making an effort to follow the text, because Owens frequently makes additional comments which can easily communicate to a non-specialist. Writing about the alto saxophonist Sonny Criss he notes how his work in the 1940s was 'uncomfortably tension-filled," and whereas some jazz historians have tended to ascribe this to the atmosphere of the times, and Criss's personal characteristics. Owens has a more practical explanation to offer. According to him, the chief source of the tension in Criss's soloing "was his disconcerting unconcern for, or perhaps inability to keep track of, the meter." There are numerous little observations like this scattered around the book, along with comments which can help clarify our thoughts about what we can hear, as when Owens points to Art Pepper's penchant for "the employment of short, choppy phrases." which are nonetheless a logical flow of ideas. Obviously, with so much space given over to technical detail, and the definition of bop not limiting itself to a particular period, Owens doesn't try to give a general history of the music. But his book can be used in conjunction with more general surveys, such as those by Ira Gitler and Leonard Feather and so made extremely useful. Thomas Owens is a Professor of Music, as well as a practising jazz musician, and Sheila Tracy once played trombone in the all-girl Ivy Benson band. But her approach to jazz writing aims for the anecdotal as a means of illustrating music. The title, Bands, Booze and Broads, says it all, and the book is mostly a collection of transcribed interviews with musicians who played in the big-bands from the 1930s through to more recent times. It's very readable, and it certainly made me want to listen to a lot of old records, but it can provide a useful antidote to jazz romanticism. Much big-band music was thoroughly routine, and the musicians knew it, and some of the drinking referred to probably came about through sheer boredom. That, and the hard slog of being on the road. The tales of long trips on cramped buses, nights without sleep, missed or hurried meals, racial prejudice, and low wages, make you realise how little glamour there was in areas of the music business. And the word "business" is accurate in referring to the way things operated. Many bandleaders ran their organisations on those lines. Ray Anthony took the view that "musicians are children in a sense," and he saw it as his job to keep them in line with fines for being drunk, having unpolished shoes or unpressed pants, and generally misbehaving. Some leaders were less authoritarian, of course, and certain musicians didn't take kindly to too much discipline. The jazz-inclined players were always notoriously hard to control, but other big-band musicians viewed their work as simply a way of earning a living and would stay with the same leader for years. It's a mistake to assume that all big-bands played innovative music, and most merely served up the undemanding fare wanted by the public Even the better bands had to produce novelty numbers, and play standard dance arrangements, in order to stay in business. Musicians often wanted to be in certain bands, though. even when the leaders were known to be difficult. Benny Goodman had a reputation for demanding perfection, and there is a harrowing description of him ordering the great black saxophonist, Wardell Gray, off the stand because he was a second or two late when getting up to take a solo. Goodman seems to have aroused strong reactions from those who worked with him. but Ed Wasserman said: 'There are stories about him as we all know but for me there was no problem. All you had to do was come to work on time, dress, shave, etc., and do your job." It's one of the pleasures of reading Bands, Booze and Broads that there are differing opinions about what life in the big-bands was like. And although the book might seem to be designed for people who remember the days when the bands appeared in theatres and dance-halls, and when popular music was largely played by big-bands. it can help evoke the atmosphere of the past for those who didn't experience it. The records are still available, and listening to them while reading Bands. Booze and Broads can be an illuminating exercise. 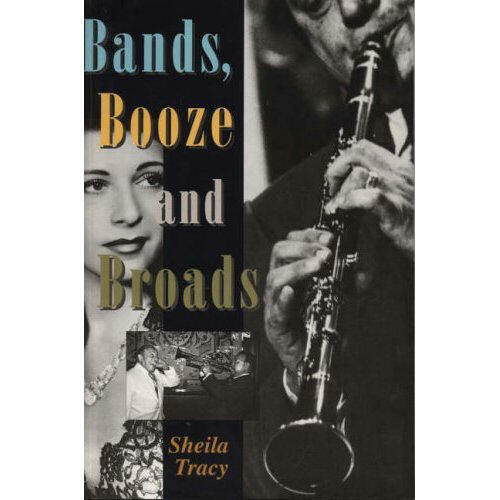 BANDS, BOOZE AND BROADS by Sheila Tracy. Mainstream Publishing. £ 17.50.